Nihon Falcom Corporation has just published their financial report for their previous fiscal year which ended in September 2018. They have managed a 15.6% rise in sales and an around 30% increase in profit after having primarily released the whole Trails of Cold Steel tetralogy on PlayStation 4 in Japan, while also localizing and porting their previous titles to other regions and platforms. For example, the English localization of Tokyo Xanadu eX+ and the Nintendo Switch & PC Steam ports of Ys VIII: Lacrimosa of Dana were also released during the fiscal year. The year 2019 will mark the 15th anniversary of the Trails series. The Trails of Cold Steel series has surpassed 1.5 million copies in overall sales, and we will expand the sales even further. We plan to expand the Trails of Cold Steel series in not only Japan but also North America, Europe, and Asia. 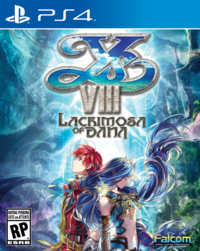 Ys VIII: Lacrimosa of Dana has surpassed 500 thousand copies in overall sales, and we will continue to expand it by releasing a year-end exclusive package among others. A number of titles, including a brand-new title of the action RPG series Ys - which had its 30th anniversary last year - are planned to be released for consoles. We will continue to proactively pursue multiplatform expansions of content owned by Falcom which will be applied worldwide. We will further enhance digital sales which has had a remarkable growth. This also includes DLC. As for mobile apps that are planned to be released in Asia like Trails of the Star and Ys: The Five Great Dragons of Artago, first of all they are being planned to be released in Hong Kong, Taiwan, and Macau in order. One of the major points in this list is that a brand-new Ys game among others is going to be released within Falcom's current fiscal year. This goes in line with the company president Toshihiro Kondo's confirmation in August that they are currently working on it. Other than that, Nihon Falcom has also reiterated their commitment to localize the Trails of Cold Steel series overseas. The English localizations of Trails of Cold Steel I and II on PC have recently got updated with the much-requested Japanese voice option, and they also have PS4 versions which will be out in early 2019. As the financial report suggests that Korea and Chinese-speaking regions will get Trails of Cold Steel III and IV soon, we hope the English localizations of the latter two games shouldn't be too far away now.